For years we see such quotes on restaurant rating websites as Yelp, Tripadvisor and many more. Rating and reviewing is very important to inform other (future) customers and give a company feedback. With rating a product or service is nothing wrong, but what if this becomes normal for people? What if above quotes were not about restaurants, but about real human beings? For restaurants, services and online retailers, third party ratings are very important as it shows that customers actually appreciate their products or services, or not. It helps to get a better idea of the value of the product. Companies trust the customers to write honest feedback and don’t make things up, but of course this happens often. Everyone who reads a review sometimes knows that there are many people writing negative feedback just to shovel dirt on the company because this person didn’t get what he wanted. Excessive negative criticism happens a lot, and we’re just so glad that this is written to the company and not with a stamp on someone’s head, or on an individual’s online profile. The reality is that it’s already possible. In popular Netflix-serie Black Mirror people get rated with an app and so get access to, for example, flights. This might be a fictive program, but how about Uber, the famous drives and food delivery service? After a drive with an Uber the passenger can rate the driver. This is quite normal as the driver delivers a service and the customer can rate the used service, but the driver can also rate the customer one to five stars. Of course this is a good thing and makes the market work like a free market does. Good drives attract more customers, good customers attract drivers quickly. No problem with that. If a person can’t behave in someone else’s car, it’s harder to find a driver and forces him to behave. If there’s a bad driver, the market will force him to adjust this driving style. It’s based on trust and reliable people, and the restaurant reviewing sites have shown that it’s not possible to let this market work properly, as there are too many people not capable judging well. We don’t talk about restaurants in this case, but about people, not about services or goods, but about real human beings. One time bad behaviour stays in Ubers rating for the next 200 rides, so if you use Uber one time per week, it takes you around four years to remove your one time bad behaviour. It’s even getting worse, in the United States the app Peeple is launched. 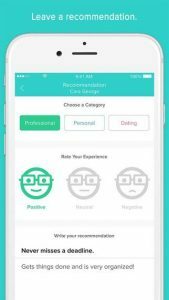 The creator Julia Cordray promotes the app as “revolutionising the way we’re seen in the world through our relationships.” The idea is that people can rate each other based on five star system and add any comments. The people rated will be in full control of the comments and decide what’s published on their profile and what not. 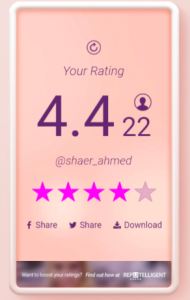 Of course the app protects bullying in this way, but people will only publish the positive comments on their page, even when they are a “3-star” (feeling ill to write this), they create an even more fake world. During the announcement the introduction of the Truth Licence was made, where you can view other people’s private profile, with all comments even the deleted ones. (The Register, 2018). The app is only accessible for people on the app store in the USA, so I wasn’t able to try it so far and see myself how everything works. The requirements to use the app are being at least 21 years old and have a Facebook profile. This of course, is a bulletproof system, as everyone uses their real age on Facebook and no one can make a fake profile on the platform. You understand that it’s easy to act like someone else or even hack someone and totally destroy their reputation or rating. We’ve also learnt from restaurant and website reviews over the last years that there isn’t an equal balance between people who write good reviews and reviews with constructive criticism. Mostly people with complaints or people who just want attention or free products are writing the reviews, with unsubstantiated arguments or even hate speech in there. In the case of restaurants an unequal balance is in general not that important, as every restaurant should appreciate any feedback to improve their service. But in the case of reviewing people, this is not the case. People have emotion and confidence, a heart and the feeling that they are good how that are. Restaurant are expected to have a certain standard made of etiquettes and norms where you pay for in the end. So when this isn’t right some constructive feedback is justified. But people are all different and no one is obliged to follow etiquettes or certain norms, we wish it, we appreciate it, but we can never ever require this, and when it’s missing give a low score or criticise people on this. We just have to accept and trust that they will find their own way, and not a way other people force them to go because of their ranking. Not to speak about all the difficulties and misjudgements that will occur when talking about cultural differences, and what will happen to this. For example, a western person meets an asian person in Asia, the western person stretches his hand and the asian makes a ‘wai’ (asian greeting red. ), a misunderstanding and awkward moment follows. Afterwards the asian person rates the western person 3 stars “Good person, should learn something about eastern way of greeting”, the other person rates 1 star “Weird behaviour, no manners, avoid this person”. Of course this is an extreme situation, but to let you think about it. We’re different and that’s good. Is this app or system going to create a certain global guideline for everyone to behave? With the punishment that you won’t get your starts if you act different then required? Watch the clip from Black Mirror. Can you imagine that you can’t have access to certain public services, have to wait for blood transplantation, have to buy less fresh bread, or earn less just because you are a 4-star and not a 4.5? We have to stop this ongoing madness by relying on our own judgement skills, and never trust prejudgements made by people you don’t even know. Use information about others, from others so you have an idea what to expect. Trust on yourself and give each individual an opportunity to make a first impression. Don’t just take over judgements from others. Believe in the fact that people can get out of bed in the morning feeling a different person, that every person can make a change every day and become a better person than the day before. Not judged on previous actions or misjudgements made by others, not ranked by stars or marks. Trust on yourself, be a human, not a machine. Tagged black, blog, media, mirror, peeple, people, problems, rating, social, uber, world. Bookmark the permalink.